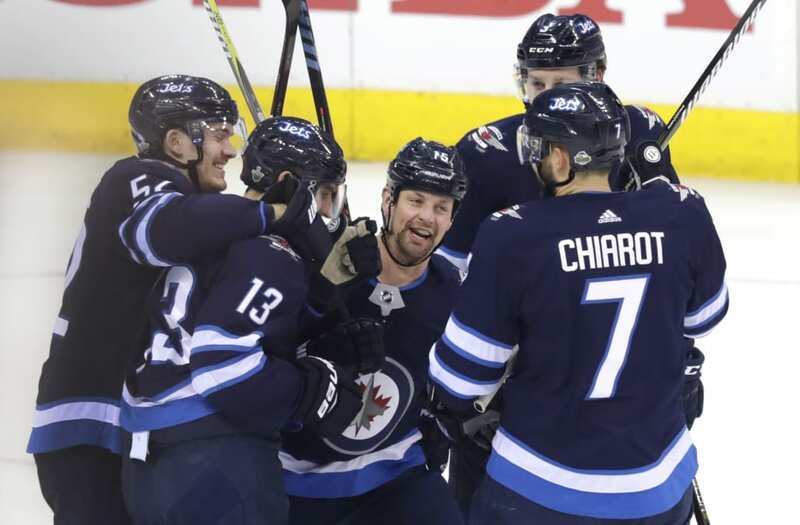 Connor Hellebuyck's second consecutive shutout and a four-goal first period powered the Winnipeg Jets as they completed a series victory by defeating the visiting Minnesota Wild 5-0 in Game 5 of the Western Conference quarterfinals Friday night at Bell MTS Place in Winnipeg, Manitoba. It's the first postseason series triumph for the Jets in franchise history. Jacob Trouba, Bryan Little, Brandon Tanev and Joel Armia scored in the game's opening 12 minutes. Mark Scheifele added his fourth goal of the series in the third period. Hellebuyck, named a finalist for the Vezina Trophy earlier in the week, made 30 saves. Three nights earlier, he also stopped all 30 shots he faced for his first career postseason shutout. The outcome made a Game 6 unnecessary Sunday in Saint Paul, Minn. The Jets were 32-7-2 during the regular season at home, and they've gone 3-0 in postseason home games. They hold a 12-game overall home winning streak heading to the Western Conference semifinals. Paul Stastny and Dustin Byfuglien each recorded two assists. Wild goalie Devan Dubnyk didn't make it through the first period, giving up four goals. Alex Stalock finished, stopping 15 of 16 shots. Trouba scored just 31 seconds into the game as the Jets put the Wild in trouble right from the opening minute. The Jets played without defenseman Josh Morrissey, who drew a one-game suspension after an illegal check on Minnesota center Eric Staal in Game 4. Winnipeg defenseman Tyler Myers had been out since sustaining a lower-body injury in Game 3. He was back and logged more than 22 minutes Friday night. The Wild played for the second game in a row without left winger Zach Parise, who suffered a broken sternum in Game 3. Minnesota added defenseman Ryan Murphy to the lineup for his first career playoff game. He was even in plus-minus. Minnesota was trying to recover from a 3-1 series deficit much like it did twice during the 2003 postseason.